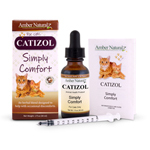 Petizol (formerly known as Pet's PAIN Formula) helps relieve aches, pains, inflammation, and reduce fever. Pet's PAIN Formula is an all natural organic herbal remedy designed to help relieve pain, reduce inflammation, and fever. Pet's PAIN Formula may help with restlessness. 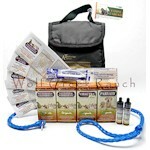 It eases muscle pain, joint pain, and general nerve pain. Pet's PAIN Formula is soothing to the digestive tract and can be used for cramping pains in the intestinal tract. Pet's PAIN Formula contains organic herbs, like Feverfew, which has been clinicially proven and effective for migraine headaches as well as reduces inflammation and fever. This natural product is NOT recommended for cats or birds! **For larger animals, give 5 drops for each additional 100 pounds of body weight. Shake well before use. Select proper dosage of Pet's PAIN Formula. Give orally 1 to 3 times daily as needed. NOTE: Pet's PAIN Formula should not be taken if you or your pet have a sensitivity to aspirin. Cats cannot tolerate aspirin products as they can cause kidney failure in cats. One 1 oz. bottle of Pet's PAIN Formula will treat approximately 3 meduim size dogs. 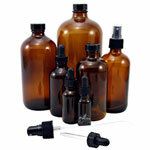 Pet's PAIN Formula has a 4 year shelf life. Do NOT give to CATS or BIRDS! Pet's Pain Formula contains organic: Wild lettuce, Arnica, White Willow Bark, Feverfew, Meadowsweet, Wintergreen, Alcohol, and Filtered Water. Caution: For use with pets 6 weeks or older. Do not use with pets under 6 weeks old. If younger than six weeks, you may dose the mom and the babies will get the benefits of the product via nursing. Keep out of reach of children. NOT recommended for pregnant animals. An overdose can cause miscarriage. Do NOT give to cats or birds, as they can experience kidney failure when given aspirin like substances. Watch for allergic symptoms such as hives, trouble swallowing and swelling around the eyes. If one is experiencing any adverse symptoms or notes any adverse signs, then cease using this product & immediately contact your nearest emergency medical system. The use of Pet's Pain in the presence of endocrine pancreatic dysfunction (e.g. diabetes mellitus or acute infectious pancreatitis) and evidence of liver disease is a contraindication due to the presence of ethyl alcohol in this product. Alcohol may be removed by protocol (for every drop of Pet's Pain, add 1 drop of hot water and let cool). Turmeric & Boswellia Joint Formula ~ 1 oz. 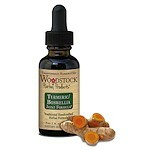 BOSWELLIA & TURMERIC JOINT FORMULA ~ provides natural, effective relief from joint pain and inflammation.